I remembered when I was a child in primary school, the teacher taught us the basics of geometry using the “tangram” device, which is an ancient Chinese puzzle obtained by dissecting a square into seven geometric shapes. We were given the challenge to use our imagination and create objects or animals bound by the mathematics of these shapes. 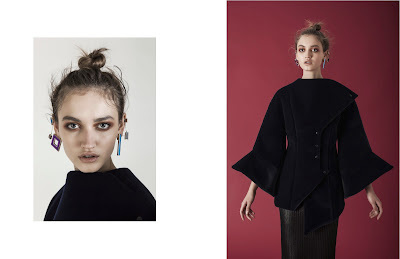 Paris-based designer Sylvio Giardina uses the “pulling apart to recreate”concept of a tangram and gives it a new light for his FW16 collection, called SEVEN. Contrary to Giardina’s previous dark and mysterious imageries, SEVEN adapts a modern-fantasy vibe. The collection is conceived on the definition of geometric shapes, yearning to break with strict rules in order to build dynamic geometries and ever-changing volumes. “Irregular cuts outline essential lines, asymmetrical hems and necklines of knit and satin dresses or trace velvet and vinyl intarsia on outerwear and slip dresses, reproducing alluring architectures. As for colour palette, FW16 season is focused on black, blue and dove rendered on shiny fabrics such as satin, knit and jersey, or are matched with velvet lace brocade and neoprene-knit. 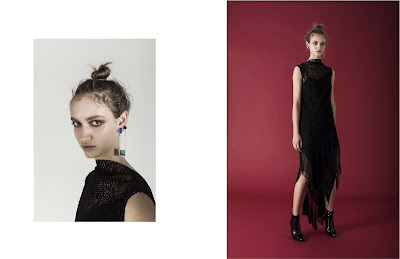 It gives an overall feel of edgy minimalism, dazzled with feminine elegance. Geometric shape-defined accessories, by default are needed to complete the tangram-ideology. 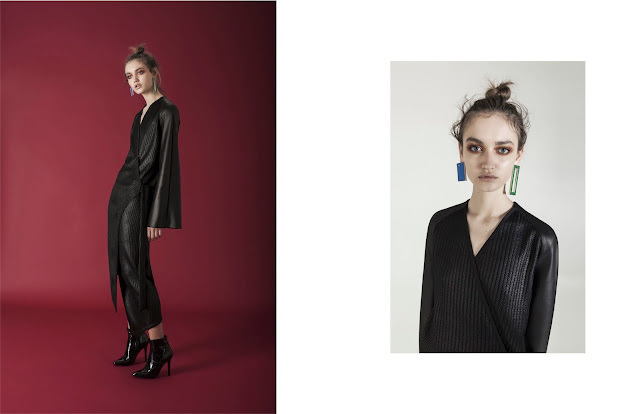 “The earrings evoke small constellations and the peculiar brooches on the outfits give way to edgy shapes”, arousing not only the wearer’s creativity, but also channeling the fantastic retro-60’s mod motifs. 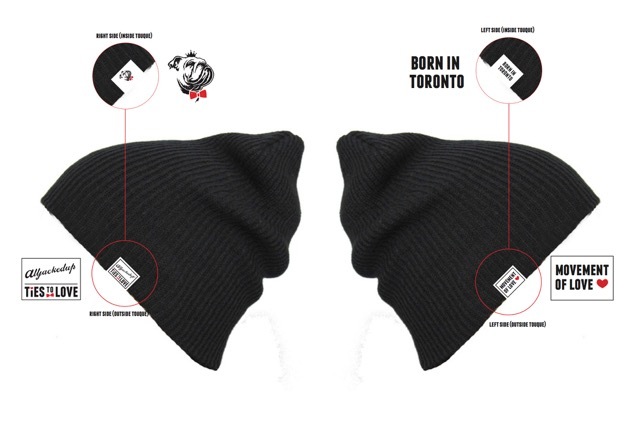 Alljackedup, a Toronto-based label dedicated to queer, androgynous and trans-masculine fashion conscious has recently launched “Ties to Love” toques. Following the limited edition trans heroes bow ties for Transgender Awareness Week in past November and snapbacks for Valentine’s Day, the latest addition of toques was designed for release in the run up to International Transgender Day of Visibility (TDoV) on March 31st. TDoV was founded by Michigan-based transgender activist Rachel Crandall in 2009 in response to the lack of celebration holiday for transgender people. Through his brand, Jackson hopes the community learn more about the Ties to Love campaign, which was developed in response to the high rates of suicide attempts, and discrimination within the transgender community. The campaign encourages people to wear bow ties, snapbacks, and now toques and post selfies to the Facebook campaign group offering messages of support and sharing their own stories with the hope to increase visibility and awareness of the diverse and unique lives of transgender community. Jackson approached high profile successful role models who act as ambassadors for the Campaign. To date, Mayor of Toronto, the Chief of Police, Canadian brand Walk Off The Earth, Chase Ross, prominent UK trans activists Fox Fisher, Jake Graf and many others have all showed their support. 10% of all sales via alljackedup in March will be donated to the YMCA Sprott House, Canada's first LGBTQ transitional housing program, in Toronto. We’ve been feeling disappointed ever since Uber is no longer available in Calgary. As far as the size of this city goes, we have one of the worst transportation systems. A friend of mine from overseas once visited Calgary for a business meeting and was shocked that we don't even have a direct train from the aiport to downtown. As an avid traveler with tight schedule, being able to use a ‘ride locator’ app really eases stress and makes everything more convenient. Not to mention the app will come in handy especially when one of those nights where you had a few drinks at the party. I mean finding a taxi if you are not within inner city limit, has proven to me in the past, very difficult. No worries though, the recent launch of Canada’s first national all-in-one taxi and transit app The Ride is now my alternative way for travel. The Ride is developed by CellWand Communications, the Canadian mobile technology company behind the popular #TAXI service (Pound Taxi), and is available for iOS and Android. The features of this app include taxi e-hailing, all means of public transit and car-sharing options across the country. It allows users to e-hail the closest licensed taxi, find a carshare location, and plan their route on local transit options including subways, buses, LRTs and streetcars, as well as compare the estimated travel time and cost for each option. Unlike other e-hailing apps, The Ride has partnered with leading local taxi fleets, and is directly connected to over 6,000 taxis as part of its e-hailing network at launch, making it the most comprehensive e-hailing app in Canada with more cab fleets connecting to The Ride every week; an additional 3,000 taxis are currently being integrated. By partnering with multiple taxi fleets, the app maximizes the number of drivers available and books one of the closest licensed taxis, regardless of company. 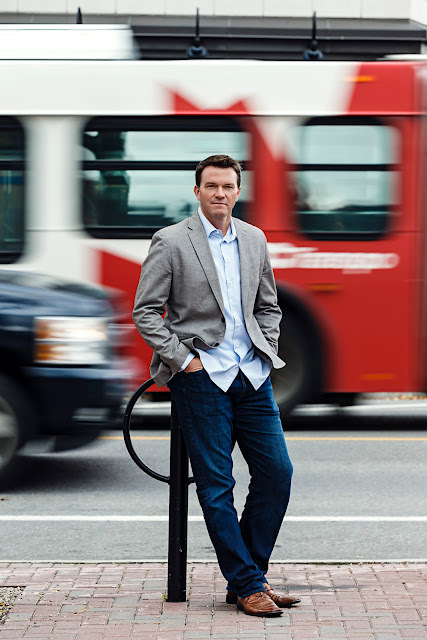 Where e-hailing is currently not available, The Ride connects users to the dispatch of fleets representing all 25,000 additional taxis across Canada. 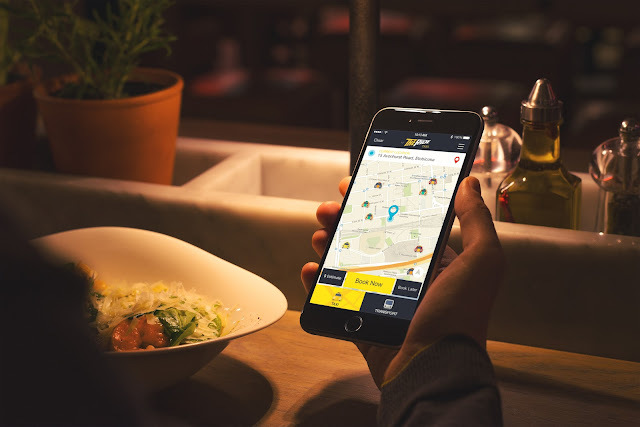 The Ride utilizes the user’s location, allowing them to view and connect to a nearby taxi, track their ride once assigned and on route along with an automatically updating ETA. 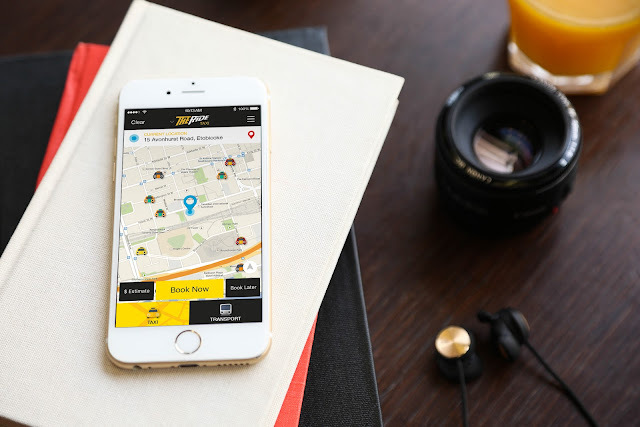 The app also supports driver ratings and The Ride’s database tracks the ratings of individual drivers and cab companies, to ensure users get the best available option wherever they use the app. The Ride is partnered with local fleets providing standard taxi pricing, with no surge charges at any time, and every driver is fully trained, licensed and insured. Users of The Ride can also enter their destination to compare estimated trip times and costs for various methods of transportation, including taxi and transit. If a user decides to take a taxi, they can order one of the closest available taxis through the app for a convenience fee of $2, or $1 if they connect directly to the first available dispatch. The Ride has partnered with major mobile carriers across Canada, so convenience fees will appear on users’ wireless bill. Convenience fees will be waived during the first 30 days of use for all consumers. The Ride is also the exclusive National Taxi and Transit App Sponsor of MADD Canada, a national charity dedicated to stopping impaired driving and supporting victims of impaired driving crimes. A portion of each convenience fee from every use of the app will go directly to MADD Canada. SPECIAL OFFER JUST for Binzento Vincente Fans!! The Ride is available for download on the App Store and Google Play store. Download the app today, and enter promo code within the app: RideWithVincent to get a FREE e-hail credit. Note: First 30 days after downloading the app, all convenience fees are waived, so the free credit is good for use after the first 30 days!